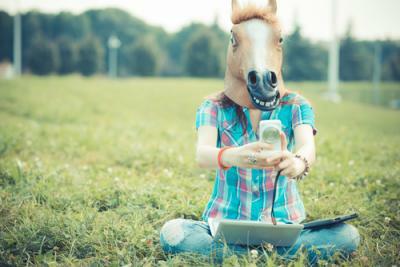 There was a story about a senior manager working for one of the largest banks in the UK who sent his teenaged daughter selfies on Snapchat. This is not such an unusual thing, but these selfies were taken in bank committee meetings and came with captions describing the scene as "boring meeting" or "not a fan of board meetings". For those unfamiliar with Snapchat, its primary function is to make messages disappear almost instantly. The problem for this father was that his daughter took screenshots of his selfies and then shared those pictures on Instagram, where they found their way back to management at the bank. We would expect this executive likely won't be bored by meetings at that particular bank any time soon. There are numerous lessons, but the most important are: 1) teenagers share everything and 2) the use of social media without considering all the possible consequences is dangerous. There may be some generational ineptitude regarding computers and social media, but almost everyone has integrated them into every part of life. Studies indicate that the majority of people 55Ys and older prefer to do their banking online over any other method, a significant increase over the number just 5Ys ago (when fewer than 40% preferred online banking). Even higher numbers can be found in the adult population as a whole, where 62% prefer online banking to branches. More importantly than the totals is the trend. Here there has been a very large increase in the number of customers not only using online banking, but preferring it. Bank web sites offer a wide variety of options and hopefully yours says something that distinguishes you from your competitors and reflects the spirit of your bank. Targeting specific customer niches is a good tactic for web site messages and web sites are a great resource for your image (and a conduit for your services). Larger banks are all over the internet and usually have pretty robust websites. Certainly there is expense involved in having the latest and greatest technology and keeping up, but how does this compare with the cost of building a branch. In one study, a $700mm community bank was examined to understand the cost/benefit. The question was asked whether the bank should build a branch or take on a major technology investment for about the same initial amount - around $1mm. As expected, once built, the annual maintenance cost of a branch over technology was much higher, while the number of customers that could be served was exponentially higher with a technology investment. Most of all, the 10Y comparison of construction and maintenance cost to serviced customers was significant - over $4,000 per branch customer vs. less than $181 for technology. Community banks need branches, but times are changing and fewer customers are coming in. More and more customers are accessing banks remotely through RDC, online or mobile. As such, moving the bank forward in the current market environment is going to require bankers take a close look at what the website has to offer and what the major competition in the area is offering on their website. Our UK banker's Snapchat experience is the social media equivalent of a public figure making an inappropriate comment and not realizing a microphone was still live. To avoid such mistakes, make sure your bank is presenting the message it intends on its web site and that the message is live and relevant to customers and prospects alike. Treasury yields rose 1bp by the close in what proved to be yet another quiet day for the market. Yields are currently unchanged while investors wait for March existing home sales to be announced. The BLS reports there were 5.1mm job openings as of Feb, the highest level since 2001. A survey in Bank Director by Crowe Horwath finds only 10% of bank executives and directors at banks under $500mm in assets say the relationship of their merged board and/or senior management team is highly cooperative and cohesive. This compares to 70% who said so at banks with assets of $5B or more. In the next 10Ys, about 75% of the workforce will be millennial workers. The IMF has released a warning that financial stability risks have been rising over the past 6 months. The IMF cited movement from banks to shadow banks, liquidity risks, currencies and emerging markets. The latest report from the Treasury finds the top 10 foreign holders of Treasuries (72.2% total) are: Japan (19.9%); China (19.9%); Caribbean Banking Centers (5.7%); Belgium (5.6%); Oil Exporters (4.8%); Brazil (4.2%); Switzerland (3.3%); UK (3.1%); Luxemburg (2.9%) and Hong Kong (2.8%). Accounting firm Ernst & Young will pay $10mm to settle allegations it committed fraud by allowing Lehman Brothers to hide transactions from its balance sheet prior to its collapse. Bank of America Merrill Lynch's 2015 CFO Outlook survey of 600+ US corporate financial executives finds the following measures are begin used by companies to offset healthcare costs: passing costs to employees (79%); implementing preventative/wellness plans (66%); cutting spending in other areas (61%); offering HSAs (59%); raising prices for products and services (50%); accepting lower profit margins (38%); changing retirement services (17%) and reducing company workforce (12%). JPMorgan reduced its Q1 GDP forecast from 2.0% to 1.5% given weaker economic data, but pointed out that in Q1 headwinds of weather, a strong dollar and the port shutdown in CA have subsided so that growth should now accelerate into mid-year.